As of 2018, it features a 21-week regular season where each team plays 18 games with three bye weeks. This season traditionally runs from mid-June to early November. Following the regular season, six teams compete in the league's three-week divisional playoffs which culminate in the Grey Cup championship game in late November. The Grey Cup is one of Canada's largest annual sports and television events. The CFL was officially founded on January 19, 1958. The league was formed through a merger between the Interprovincial Rugby Football Union (founded in 1907) and the Western Interprovincial Football Union (founded in 1936). In 1956, the IRFU and WIFU formed a new umbrella organization, the Canadian Football Council (CFC). In 1958, the CFC left the CRU and became the Canadian Football League. As part of an agreement between the CRU and CFL, the CFL took possession of the Grey Cup, even though amateurs had not competed for it since 1954. The CRU remained the governing body for amateur play in Canada, eventually adopting the name Football Canada. Initially, the two unions remained autonomous, and there was no intersectional play between eastern (IRFU) and western (WIFU) teams except at the Grey Cup final. This situation was roughly analogous to how the American baseball leagues operated for years, and how the AFL and NFL operated during the 1960s prior to its merger in 1970. In 1986 the Concordes were renamed the Alouettes to attract more fan support, but the team folded the next year. The loss of the Montreal franchise forced the league to move its easternmost Western team, Winnipeg, into the East Division from 1987 to 1994, and again from 1997 to 2001 and 2006 to 2013 when Montreal resumed operations, but Ottawa was unable to field a team. The CFL returned to an all-Canadian format in 1996 with nine teams; the league conducted a dispersal draft to distribute players from the shuttered American-based teams; however, the Ottawa Rough Riders, in existence since 1876, folded after the 1996 season (another dispersal draft was conducted the next year to distribute the former Rough Rider players among the remaining eight teams). Toronto and recently revived Montreal also were struggling; Montreal's woes were solved by moving to Percival Molson Memorial Stadium, a much smaller venue than the cavernous Olympic Stadium. In 1997, the NFL provided a US$3-million interest-free loan to the financially struggling CFL. In return, the NFL was granted access to CFL players entering a defined two-month window in the option year of their contract. This was later written into the CFL's collective bargaining agreement with its players. The CFL's finances have since stabilized and they eventually repaid the loan. The CFL–NFL agreement expired in 2006. Both leagues have been attempting to reach a new agreement, but the CFL broke off negotiations in November 2007 after Canadian telecommunications firm Rogers Communications paid $78 million to host seven Bills games in Toronto over five seasons (the last Bills Toronto Series game was played during the 2013 NFL season). During Mark Cohon's time in office many of the teams either undertook major renovations to their existing stadiums, or constructed brand new stadiums. The Montreal Alouettes were the first to undertake this project, adding 5,000 seats to Percival Molson Memorial Stadium in time for the 2010 CFL season. The Edmonton Eskimos and Calgary Stampeders also renovated their respective stadiums and facilities for the 2010 season. In 2011, the BC Lions played under a new, retractable roof in BC Place after spending one and a half seasons at Empire Field. In 2013, the Winnipeg Blue Bombers moved to Investors Group Field, an entirely new stadium at the University of Manitoba. The Hamilton Tiger-Cats began using their new stadium, Tim Hortons Field, after spending 2013 at University of Guelph's stadium and the first half of the 2014 season at McMaster University's football field following the demolition of the iconic Ivor Wynne Stadium. The Toronto Argonauts entered a period of transition off the field, with new ownership and a new stadium. The Argonauts were sold by politician/businessman David Braley to Bell Media and MLSE chairman Larry Tanenbaum. At the start of the 2016 season the Argos moved to BMO Field after more than twenty seasons at the Rogers Centre (formerly called the SkyDome from 1989 to 2005). Construction on the New Mosaic Stadium for the Saskatchewan Roughriders was completed in October 2016 and the first game was played in the 2017 season. On June 29, 2017, the CFL announced Randy Ambrosie would succeed Orridge as CFL commissioner. The move was made official on July 5, 2017, with Ambrosie named as the 14th Commissioner of the league that day. Having spent 9 seasons as a player with the Calgary Stampeders, Toronto Argonauts and Edmonton Eskimos from 1985 to 1993, Ambrosie is the first commissioner to have played in the league since Larry Smith left the position in 1997. On September 12, 2018, it was announced that Buffalo, New York-based New Era Cap Company would become the official apparel supplier of the CFL beginning in 2019, replacing Adidas. In October 2018, the CFL began focusing marketing internationally again after the unsuccessful expansion into the United States during the 1990s, with Ambrosie's plan being called CFL 2.0. Ambrosie partnered with the LFA for player development, as part of the league's plan to expand globally. Ambrosie also later announced a special edition of the CFL Combine to be held in 2019 in Mexico for Mexican players which was held on January 13, 2019. Ambroise voiced that he wished the combine in Mexico would become annual and furthermore a combine could be held in Europe. On January 14, 2019, the league held a draft of LFA and Mexican university players where wide receiver Diego Jair Viamontes Cotera was the first pick, being picked by the Edmonton Eskimos. The CFL announced in February 2019 that German and French football players from the German Football League and French American Football Federation would be participating in the CFL national combine. Throughout early 2019, Ambrosie actively traveled Europe forming partnerships between the CFL and top-level European American football leagues and associations, specifically Germany (GFL), Austria (AFL), France (FFFA), the Nordic countries (NL, VL, SS, & NAFL), and Italy (IFL). Atlantic Schooners 1 Halifax/Dartmouth, Nova Scotia 1984 Venture was abandoned due to lack of stadium funding from provincial government. San Antonio Texans 1 San Antonio, Texas 1993 Folded before beginning play. Proposed Mississippi team Jackson, Mississippi 1995 While numerous locations (including Milwaukee and Los Angeles) had been discussed as a home for a potential relocation of the Las Vegas Posse, Mississippi came the closest to fruition: it had hired a coach and general manager and was included on early drafts of the 1995 schedule before the corporation that owned the Posse raised the price unexpectedly to more than could be justified just as the new owner was about to buy the team. Miami Manatees Miami, Florida 1995 After exploring multiple cities to relocate the Las Vegas Posse, Miami was chosen. However, the league suspended all US operations before the team could ever take the field. Proposed Houston team Houston, Texas 1996 After most US CFL franchises folded, the Baltimore Stallions considered relocating to Houston; league pressure led Stallions ownership to take over the dormant Montreal Alouettes instead. Norfolk Pirates/Hampton Roads Pirates Norfolk, Virginia, or Hampton, Virginia 1996 Owners for the Shreveport Pirates attempted to relocate the team to either Norfolk or Hampton, Virginia. However, the city refused to invest $400,000 in renovations after finding out about multiple lawsuits against the owners and the venture was abandoned. Proposed second Shreveport team Shreveport, Louisiana 1996 An investment group had prepared to purchase the Birmingham Barracudas and relocate them to Shreveport, replacing the former Pirates, however the CFL cancelled its US expansion before the relocation could take place. Proposed Quebec City team Quebec City, Quebec 2006 As the Ottawa Renegades financial woes became apparent, a business group from Quebec City emerged attempting to relocate the team to their city. The venture was ultimately abandoned and the franchise was suspended by the league and later sold to Ottawa Sports and Entertainment Group. ^ The CFL considers the current Montreal Alouettes franchise to be a continuation of the original Montreal Alouettes (founded 1946, played in the CFL 1958–1981) and Montreal Concordes (founded 1982, renamed the Montreal Alouettes in 1986, folded just before the 1987 season). However this does not include the Montreal Football Club that was formed in 1872, and joined the IRFU in 1907–1915, and the Montreal AAA Winged Wheelers, who played in the IRFU during the 1930s and 40s, winning the Grey Cup in 1931. While the current incarnation of the Alouettes inherited many of the players and staff of the Baltimore Stallions, the CFL considers the Stallions a separate entity. ^ After two seasons in Shreveport, posting an 8-28 record team owner Lonie Glieberman vowed to relocate them to Virginia. There, he agreed to rename them the Hampton Roads Pirates or Norfolk Pirates if the city coughed up $400,000 in renovations. After requesting $400,000 in renovations for the team to play, local politicians declined Glieberman's request upon learning that he had lawsuits pending in Louisiana. Potential CFL expansion markets are the Maritimes, Quebec City, Saskatoon, London, and Windsor, all of which have been lobbying (unsuccessfully to date) for Canadian Football League franchises in recent years. During the 1970s and 1980s, Harold Ballard attempted multiple times to secure a second CFL team for Toronto (either by way of expansion or by relocating the Hamilton Tiger-Cats), under the premise that Canada's largest city could support two teams. No city in Atlantic Canada has a permanent stadium that meets CFL standards. As of 2010, the largest stadium in the Maritimes is Moncton Stadium, which has 10,000 permanent seats and is expandable to 20,000 with temporary seats. A pre-season game, dubbed Touchdown Atlantic, was held in Halifax in the 2005 CFL season and regular season games were played in Moncton under the same branding in 2010, 2011, and 2013. All 20,000 seats for the 2010 Moncton game sold out in 32 hours; the 2013 game did not sell out. Former Commissioner Mark Cohon has stated that Moncton Stadium would require massive renovations to host a CFL team permanently. The cost of the required renovations would be the equivalent of building a brand-new stadium. In November 2015 the Halifax city council voted 9–7 against purchasing land that would then be used to build a 20,000-seat stadium. It was agreed that the price tag for the land was too much, but the close vote indicated municipal interest in building a near CFL sized stadium in Halifax. In November 2017, the CFL conducted further discussions with a group in Halifax interested in securing a franchise for the city; the group made a "very credible" pitch to the CFL head office. According to TSN analyst Dave Naylor the group named 'Maritime Football Ltd.' consists of Anthony LeBlanc (former president and CEO of the NHL's Arizona Coyotes), Bruce Bowser (president of AMJ Campbell Van Lines) and Gary Drummond (former president of hockey operations for the Coyotes). In June 2018 the group met with the Halifax Regional Council in private about plans to bring a CFL team to Halifax, with the possibility of playing at Moncton University while a stadium in Halifax is being built. Maritime Football Ltd. ownership group selected a site in Shannon Park, Dartmouth, Nova Scotia to develop a new stadium. The stadium would be estimated to cost between $170 to $190 million and would seat 24,000 and have a business model similar to the Ottawa Redblacks, who entered the league in 2014. On October 30, 2018, Halifax City Council unanimously voted in favour of proceeding with a business case analysis of a stadium in the Halifax municipality. Following this positive momentum, Maritime Football Ltd. and CFL commissioner Randy Ambrosie announced that the group would proceed with a season ticket drive to further gauge interest in addition running a team name contest in the hopes of making an announcement on the team name just prior to the 106th Grey Cup game. The target year for the proposed team to enter the league would be 2021, with the team name including "Atlantic" in its name, but no franchise was actually awarded in this announcement. Further to the previous discussions with Moncton and New Brunswick politicians, it was also suggested that the potential new franchise could begin play in Moncton while the stadium in Halifax is built. On November 23, 2018, two days before the 106th Grey Cup, Maritime Football Ltd and commissioner Ambrosie announced the new team would be called the Atlantic Schooners. There has also been interest in adding a team in Quebec City. In 2003, an exhibition game was held at Telus Stadium between the Montreal Alouettes and Ottawa Renegades where Montreal won 54–23. In May 2009, Christina Saint Marche, a British businesswoman, announced her interest in operating a team in Quebec City—stating that there would be a natural rivalry with the Montreal Alouettes. During the 2010 Grey Cup state of the league news conference, Cohon noted that the Alouettes hold the rights for the entire province of Quebec and that any expansion would have to be negotiated with them first. Another exhibition game was held at Telus Stadium on June 13, 2015, with Ottawa (whose TD Place Stadium was in use by the 2015 FIFA Women's World Cup) hosting Montreal. In early 2012, management at Credit Union Centre publicly expressed its desire to bring a CFL team to Saskatoon. However, the Regina-based Saskatchewan Roughriders have long branded themselves as a province-wide team, and claimed that the population of Saskatchewan is too small to support two teams. In any event, Saskatoon also lacks a suitable outdoor stadium. Its largest, Griffiths Stadium, home of the University of Saskatchewan's Saskatchewan Huskies, seats only 6,171 spectators. The Gordie Howe Bowl, which has hosted CFL exhibitions in the past, has even fewer seats (it seats 3,950 people). The regular season is 21 weeks long, with games beginning in mid-June and finishing by early November. The CFL's nine current teams are divided into two divisions: the East Division with four teams and the West Division, with five teams. Each team plays two games against each of the other eight teams, plus two divisional games with opponents rotating each season. With 18 regular season games being played, each team gets three bye weeks. The playoffs begin in November. After the regular season, the top team from each division has an automatic home berth in the division final, and a bye week during the division semifinal. The second-place team from each division hosts the third-place team in the division semifinal, unless a fourth-place team from one division finishes with a better record than a third place team in the other (this provision is known as the crossover rule, and while it implies that it is possible for two teams in the same division to play for the Grey Cup, only three crossover teams have won a semifinal since the rule's 1996 inception, and neither advanced to the Grey Cup). The winners of each division's semifinal game then travel to play the first place teams in the division finals. Since 2005, the division semifinals and division finals have been sponsored by Scotiabank. The two division champions then face each other in the Grey Cup game, which, since 2007, has been held on the fourth or fifth Sunday of November. The Grey Cup is both the name of the championship of the CFL and the name of the trophy awarded to the victorious team. The Grey Cup is the second-oldest trophy in North American professional sports, after the Stanley Cup. The Grey Cup game is hosted in one of the league's member cities. In recent years, it has been hosted in a different city every year, selected two or more years in advance. The Toronto Argonauts have won the most Grey Cups with seventeen wins total, most recently in 2017. In 2012, the game was held in Toronto at Rogers Centre, and for the second year in row the cup was won on a team's home field, with Toronto beating Calgary 35–22. In 2013, the Grey Cup was won at home for the third consecutive time (by the Saskatchewan Roughriders), which had not been done since Toronto won at home from 1945 to 1947. In 2016, the Grey Cup was won on the natural grass turf of BMO Field by the Ottawa Redblacks beating the heavily favoured Calgary Stampeders 39–33 in overtime; the first Grey Cup championship for any Ottawa CFL team in 40 years. 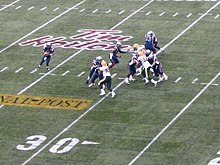 In 2008, the CFL began a new, five-year television deal with CTVglobemedia. Valued at $16 million per-year, it gave TSN and RDS exclusive rights to all CFL games, including the playoffs and Grey Cup. In March 2013, TSN exercised an option to extend its contract through 2018. In 2015, the deal was extended for an additional three years, along with exclusive Grey Cup rights for Bell Media Radio stations. On June 19, 2015, it was announced that ESPN Brasil will broadcast CFL games live, beginning on June 25, as a result of the growth of the NFL and College Football fan base in Brazil. BT Sport, which has a licensing partnership with ESPN, has also carried CFL games in Britain and Ireland since 2015. In 1982, during a players' strike in the NFL, NBC broadcast CFL games in the United States in lieu of the NFL games which were cancelled; the first week of broadcasts featured the NFL on NBC broadcast teams, before a series of blowout games on the network and the resulting low ratings resulted in NBC cutting back and eventually cancelling its CFL coverage after only a few weeks. ESPN host Chris Berman became a fan of the game in the early days of ESPN, when the network first aired CFL games, and continues to cover the Canadian league on-air. The now-defunct FNN-SCORE (unrelated to the Canadian The Score) carried games in the late 1980s. In the late 1980s and early 1990s, SportsChannel America carried games, using CBC Television, CFN and TSN feeds. In 1993, several SportsChannel Pacific-produced games that were part of the Sacramento Gold Miners' local package were also shown nationally. NFL Network took over the league broadcast contract in 2010. For the 2010 season, the network carried 14 games, no more than one each week. For 2011, the network increased its output to two games each week. NFL Network declined to continue its coverage after the 2011 season. It offered to pick up another package in 2019 on the condition that the league change its schedule to not directly compete with the NFL regular season, something that the CFL stated needs to be negotiated with the players' union. There are no blackout restrictions on radio broadcasts of CFL games, while TSN streams all games online for authenticated subscribers to participating television providers. The majority of games not on ESPN television channels are streamed in the United States via the subscription service ESPN+. In 2017, the league announced a partnership with Yare Media to offer subscription streaming packages in 130 international territories. Canadian national players enter the CFL through the CFL Draft. International players are typically inducted by way of the negotiation list: any team can lay unilateral claim to up to 45 players that have never played in the CFL at any given time (each team must make at least ten of those names public as of 2018), with no limit on how long a player can be held on the list and no limit on how old the player must be (thus CFL teams can claim players not yet eligible for the NFL Draft). Once a player on a negotiation list expresses formal interest in joining the CFL, that team has up to ten days to offer a contract (usually a league-minimum, two-year contract) to retain the player's rights. ^ In 1989, the commissioner role was split into two positions. Bill Baker held the title of President/Chief Operating Officer. Roy McMurtry, Q.C. held the position of Chairman/Chief Executive Officer. When Baker resigned, McMurtry continued as Chairman and CEO until Crump's appointment but did not serve as Acting Commissioner. ^ Between Donald Crump's resignation and Larry Smith's appointment, Phil Kershaw held the role of Chairman but was not acting Commissioner. ^ a b c William Houston (December 20, 2006). "Grey Cup moves to TSN in new deal". Globe and Mail. Toronto. Archived from the original on September 30, 2007. Retrieved December 23, 2006. ^ "CANADIAN FOOTBALL TIMELINES (1860 – 2005)" (PDF). Footballcanada.com. Retrieved January 13, 2018. ^ a b c "Canadian Football Timelines (1860–present)". Football Canada. Archived from the original on February 28, 2007. Retrieved December 23, 2006. ^ David George-Cosh, Football: Gaining a Foothold in Canada, Wall Street Journal, November 26, 2013. ^ "CFL ends working agreement with NFL". National Post. Canada. November 25, 2007. Retrieved July 1, 2010. ^ "Bills' plan exposes NFL-CFL relationship". Sportsnet.ca. October 20, 2007. Archived from the original on May 22, 2012. Retrieved July 1, 2010. ^ "CFL Sees Numbers Rise At The Gates". Sports Business Daily. November 17, 2005. Archived from the original on March 10, 2007. Retrieved December 3, 2006. ^ "2012 CFL Attendance". Canadian Football Statistics Database. Retrieved May 31, 2013. ^ "Sold-out stadiums and strong attendance across the board lead to highest average since 1983". CFL.ca. November 8, 2007. Retrieved December 29, 2007. ^ "Survey: Canadian interest in pro football is on the rise". Globe and Mail. Toronto. Canadian Press. June 8, 2006. Archived from the original on February 1, 2010. Retrieved June 8, 2006. ^ "Expansion project approved". En.montrealalouettes.com. Archived from the original on August 10, 2011. Retrieved February 18, 2011. ^ "Eskimos digging their new digs". Cfl.ca. May 27, 2010. Archived from the original on May 30, 2010. Retrieved February 18, 2011. ^ Canada (May 4, 2010). "Demise of famous roof begins BC Place renewal". The Globe and Mail. Toronto. Archived from the original on June 8, 2010. Retrieved February 18, 2011. ^ "Pan Ams will leave lasting legacy". Thespec.com. Retrieved February 18, 2011. ^ "CFL Grants Conditional Team to Ottawa". TSN.ca. March 18, 2008. Archived from the original on May 3, 2008. Retrieved June 22, 2014. ^ "Blue Bombers moving back to West Division in 2014". TSN.ca. September 13, 2013. Archived from the original on September 5, 2014. Retrieved June 22, 2014. ^ "New Lansdowne designs unveiled". Cfl.ca. Archived from the original on May 30, 2010. Retrieved February 18, 2011. ^ "New five-year CBA ratified by CFL and CFLPA". CFL.ca. June 13, 2014. Retrieved August 4, 2016. ^ "Argonauts announce sale, move to BMO Field". Retrieved August 4, 2016. ^ "Argonauts debut at BMO Field a dandy". Toronto Sun. Retrieved August 4, 2016. ^ "Update on plans for downtown Regina domed stadium coming: Enterprise Minister Ken Cheveldayoff". Cjme.com. Archived from the original on February 14, 2017. Retrieved January 13, 2018. ^ "Roughriders reveal plans to shift fans from old Mosaic Stadium to new facility in 2017". March 18, 2016. Retrieved August 4, 2016. ^ "D-lineman Michael Sam signs with Alouettes". CFL.ca. May 22, 2015. Archived from the original on May 25, 2015. Retrieved May 22, 2015. ^ a b Campbell, Morgan (May 22, 2015). "Michael Sam joins Alouettes, first openly gay CFL player". Toronto Star. Retrieved May 22, 2015. ^ "Sam leaves Als training camp". June 12, 2015. Retrieved June 12, 2015. ^ AP (June 29, 2015). "Michael Sam returns to Montreal, rejoins CFL's Alouettes". Retrieved July 1, 2015. ^ "CFL commissioner Orridge unveils league's new logo". SportsNet.ca. Retrieved August 4, 2016. ^ "CFL, CFLPA agree on new drug policy for the 2016 season". CFL.ca. April 21, 2016. Retrieved August 4, 2016. ^ "Canadian Football League issues statement regarding Jeffrey L. Orridge". CFL.ca. April 12, 2017. Retrieved April 13, 2017. ^ "CFL issues statement as Orridge tenure closes". CFL.ca. June 15, 2017. Retrieved January 13, 2018. ^ "Postmedia Q&A: CFL interim commissioner Jim Lawson". Toronto Sun. Retrieved July 4, 2017. ^ "Randy Ambrosie to be named new CFL commissioner: Report". Toronto Sun. June 29, 2017. Retrieved January 13, 2018. ^ "Canadian Football League appoints Randy Ambrosie as 14th Commissioner". CFL.ca. July 5, 2017. Retrieved July 5, 2017. ^ "New Era Cap to provide uniforms, apparel to Canadian Football League". www.bizjournals.com. Retrieved September 13, 2018. ^ a b "CFL holds combine in Mexico City in effort to grow football worldwide - Sportsnet.ca". www.sportsnet.ca. Retrieved February 5, 2019. ^ January 14, Dan Ralph · The Canadian Press ·. "Eskimos select Diego Jair Viamontes Cotera with historic 1st pick in CFL/LFA draft | CBC Sports". CBC. Retrieved February 5, 2019. ^ "CFL reaches agreement with French American Football Federation". CFL.ca. February 5, 2019. Retrieved February 5, 2019. ^ January 31, The Canadian Press ·. "CFL forms strategic partnership with German league | CBC Sports". CBC. Retrieved February 5, 2019. ^ "About the Ottawa REDBLACKS". Ottawa Redblacks. Archived from the original on February 17, 2014. Retrieved February 16, 2014. ^ "MLSE ACQUISITION OF TORONTO ARGONAUTS APPROVED BY CFL BOARD OF GOVERNORS". Toronto Argonauts. January 19, 2018. Retrieved January 19, 2018. ^ "History of the Montreal Alouettes". CFL.ca. Retrieved December 4, 2006. ^ "History". Esks.com. August 23, 1978. Archived from the original on November 25, 2010. Retrieved February 18, 2011. ^ "History". Bluebombers.com. September 27, 2011. Archived from the original on October 18, 2011. Retrieved September 27, 2011. ^ "CFL Guide & Record Book 2017" (PDF). CFL.ca. Canadian Football League. Retrieved July 14, 2018. ^ a b No Name. "Saskatoon CFL team under discussion". Ottawa: CBC l. February 1, 2012. Retrieved February 1, 2012. ^ "Walling: The CFL will be coming east". The Sports Network. Archived from the original on June 29, 2011. Retrieved February 18, 2011. ^ "canada.com - Canadian news, entertainment, television, newspapers, free email and more". Canada.com. Retrieved January 13, 2018. ^ The Canadian Football League: The Phoenix of Professional Sports Leagues, Steve O'Brien, Lulu Enterprises, 2005, p. 43. ^ "Cohon has Moncton on his mind". National Post. Canada. Retrieved December 8, 2008. ^ "CANADIAN FOOTBALL LEAGUE | CFL's Touchdown Atlantic". Newswire.ca. May 28, 2010. Archived from the original on July 27, 2011. Retrieved July 1, 2010. ^ "CFL game in Moncton a sellout". Canada: CBC. March 25, 2010. Retrieved October 5, 2010. ^ "CFL Snaps: Halifax wants right price to build football stadium". Toronto Sun. Retrieved December 1, 2015. ^ "CFL confirms discussions have taken place regarding Halifax expansion - CFL.ca". CFL.ca. November 16, 2017. Retrieved November 25, 2017. ^ a b "Group makes 'very credible' pitch for Halifax CFL franchise - Article - TSN". TSN. November 16, 2017. Retrieved November 25, 2017. ^ "Maritime Football Ltd. agree to process for securing Halifax franchise". TSN. June 19, 2018. Retrieved June 19, 2018. ^ "Halifax council gets CFL update behind closed doors". thestar.com. Retrieved June 20, 2018. ^ "Group behind Halifax CFL expansion bid picks stadium site - TSN.ca". TSN. October 26, 2018. Retrieved November 7, 2018. ^ "CFL expansion group proposes Halifax-area stadium at Shannon Park". Ottawa Sun. October 26, 2018. Retrieved November 7, 2018. ^ "Game on: Halifax votes to advance negotiations on potential CFL stadium". Global News. Retrieved November 1, 2018. ^ "Halifax council asks for detailed CFL stadium report". The Chronicle Herald. October 30, 2018. Retrieved November 7, 2018. ^ "Maritime Football LTD. announces season ticket drive for potential team". CFL.ca. November 7, 2018. Retrieved November 7, 2018. ^ Francis Campbell (October 31, 2018). "Some say Halifax should take a pass on Shannon Park CFL stadium". The Chronicle Herald. Retrieved November 7, 2018. ^ a b "O'Leary: An exclusive Q&A with Maritime Football's Anthony LeBlanc". CFL.ca. November 7, 2018. Retrieved November 7, 2018. ^ "Name Game: Potential tenth franchise to be named Atlantic Schooners - CFL.ca". CFL.ca. November 23, 2018. Retrieved November 24, 2018. ^ "Calvillo, Alouettes hammer Renegades". CBC Sports Online. June 9, 2003. Retrieved December 2, 2006. ^ "British woman wants football franchise in Quebec City". Montreal Gazette. Archived from the original on May 11, 2009. Retrieved July 9, 2009. ^ "CFL road to Quebec City goes via Montreal: Cohon". CBC Sports Online. November 26, 2010. Retrieved June 20, 2011. ^ "REDBLACKS and Als set to play in Quebec City". CFL.ca. Archived from the original on August 16, 2015. Retrieved August 6, 2015. ^ "CFL Game Schedule Announced". CFL.ca. February 14, 2007. Retrieved May 21, 2007. ^ "The Game". cfl.ca. Archived from the original on October 22, 2013. Retrieved November 25, 2013. ^ "Partnership of champions". CFL.ca. August 8, 2005. Retrieved December 3, 2006. ^ Kelly, Malcolm. "Argonauts corral Stampeders for Grey Cup on home turf". CBC. Retrieved November 26, 2012. ^ CBC News CFL still loved by Canadians, older people more than others: survey, CBC, November 28, 2014. ^ "Broadcast". CFL.ca. Retrieved December 3, 2006. ^ "Schedule". CFL.ca. Retrieved December 3, 2006. ^ "CFL announces updated schedule". CFL.ca. April 17, 2006. Retrieved December 3, 2006. ^ "CFL to introduce instant replay for 2006". CFL.ca. June 13, 2006. Retrieved December 3, 2006. ^ "CFL debuts live webcast for entire schedule". CFL.ca. June 22, 2006. Retrieved December 3, 2006. ^ William Houston (November 20, 2006). "Minor rise in Grey Cup ratings good for CBC". Globe and Mail. Canada. Retrieved December 3, 2006. ^ Penton, Kirk (May 28, 2015). "CFL extends TV deal with TSN/RDS another three years". Winnipeg Sun. Retrieved June 17, 2017. ^ Stoneberg, Allison. (June 26, 2013) ESPN to Deliver 60 Live Canadian Football League Games « ESPN MediaZone. Espnmediazone.com. Retrieved on July 26, 2013. ^ "404". TSN. Archived from the original on August 16, 2014. Retrieved August 6, 2015. ^ Derek Volner. "ESPN Secures Exclusive U.S. Rights to Canadian Football League Games". ESPN MediaZone. Retrieved August 6, 2015. ^ "ALL 2018 CFL GAMES TO AIR ON ESPN NETWORKS AND ESPN+". Retrieved August 17, 2018. ^ Skarka, Mike (June 25, 2015). "#TBT: Berman, LaPlaca Recall Vintage CFL; Wingo Explains Today's Three-Down Football". Encyclopedia of Things. ESPN Front Row. Retrieved August 6, 2018. ^ "A bola oval está de volta à TV! É a da CFL, mas já dá para matar a saudade". ExtraTime. Retrieved August 6, 2015. ^ "BT SPORT TO BROADCAST 2017 CFL SEASON IN UK AND IRELAND". Press.cfl.ca. Retrieved January 13, 2018. ^ "54, 40 or Fight" (PDF). Archived from the original (PDF) on December 18, 2010. Retrieved February 18, 2011. ^ "CFL available in all U.S. markets". CFL.ca. June 13, 2007. Retrieved June 13, 2007. ^ "CFL moves to a new home in the US". CFL.ca. June 13, 2007. Retrieved June 30, 2010. ^ "Canadian Football League back on NFL Network". Retrieved June 25, 2011. ^ 100th Grey Cup Game to air live in US on NBC Sports Network Archived October 16, 2015, at the Wayback Machine. ^ "NBC Sports Network to showcase CFL in 2013 | CFL.ca | Official Site of the Canadian Football League". CFL.ca. Archived from the original on December 3, 2013. Retrieved January 5, 2014. ^ "U.S. fans with cable will have to pay $5/month more to watch the 68 CFL games on ESPN+". Awful Announcing. May 24, 2018. Retrieved November 25, 2018. ^ "CFL 2017 season to be livestreamed in more than 130 countries". CFL.ca. June 16, 2017. Retrieved November 25, 2018. ^ CFL broadcasters page. Retrieved March 6, 2008. ^ "CFL Gets Sirius". CFL.ca. April 24, 2006. Retrieved December 3, 2006. ^ "CFL salary cap won't change". Globe and Mail. Canada. Canadian Press. January 14, 2009. Retrieved January 14, 2009. ^ a b "New CFL-CFLPA CBA at a glance". CFL.ca. Archived from the original on July 3, 2010. Retrieved August 1, 2010. ^ a b c "New five-year CBA ratified by CFL and CFLPA". CFL.ca. Archived from the original on September 23, 2015. Retrieved August 6, 2015. ^ a b "Salary Management System". CFL.ca. Archived from the original on January 21, 2015. Retrieved December 27, 2014. ^ "Some CFL players not happy with concessions made". CBC.ca. Retrieved December 27, 2014. ^ "The Manziel contract situation just got complicated - Article - TSN". TSN. January 9, 2018. Retrieved January 9, 2018. .
^ "Details of Bo Levi Mitchells contract with the stampeders - Article - 3downnation". 3downnation. February 19, 2018. Retrieved February 19, 2018. .
^ "What percentage of league-wide revenues did CFL players get in 2013 under the old CBA?". Ca.sports.yahoo.com. Retrieved January 13, 2018. ^ "Canadian QB Marc Mueller speaks out against the CFL's quarterback ratio rule". Yahoo! Sports Canada. April 23, 2012. Retrieved August 6, 2015. ^ Naylor, Dave (January 29, 2018). "The enduring mystery of CFL negotiation lists". TSN.ca. Retrieved June 9, 2018. ^ "Organization of the CFLPA". CFLPA.ca. Archived from the original on November 2, 2006. Retrieved December 3, 2006. ^ "TransGlobe Evaluation Camp". CFL.ca. Retrieved May 22, 2007. ^ "Harris completes journey from bleachers to Grey Cup glory". TSN.ca. November 28, 2011. Archived from the original on July 28, 2013. Retrieved November 28, 2011.